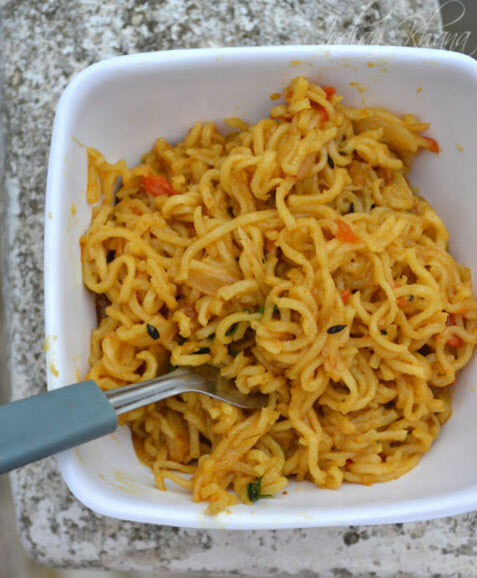 Maggi recipe? I know most of you thinking I have gone insane but that's not the case yet. 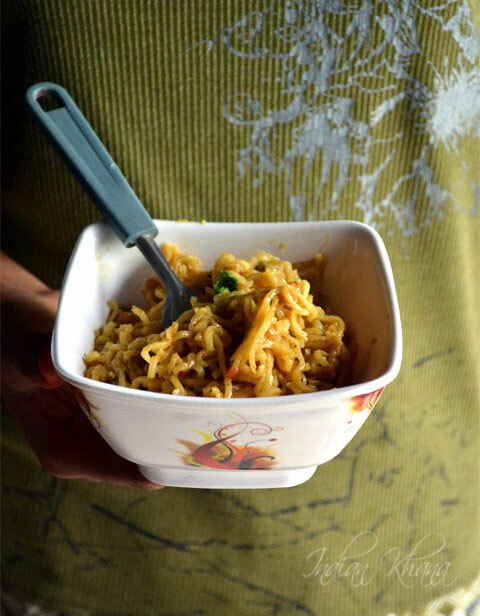 This maggi noodles recipe is not the usual way we make maggi masala noodles. Oh, well! I know there are ample of variations we do but for me I normally add few veggies and boil the noodles to relish it as a quick meal or snack and mostly I will keep water to have it as noodles soup. But today it's not about what I do but rather our niece does, this is her recipe and trust me it's fabulous. You can add more vegetables apart from what listed in the recipe to make it more filling or follow the same recipe and add normal noodles instead of maggi nooodles, for masala mixture add mix of chili, coriander seeds, turmeric powders plus garam masala or kitchen king masala powder it's all about how we customize it to suit our needs but before doing all that do try this and thank me later for sharing this with you all. And ya it's not our 2 minutes noodles for sure. 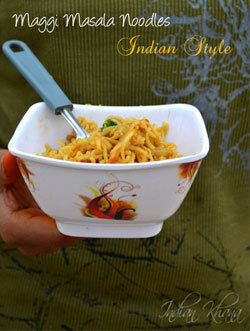 Maggi Masala Noodles made in Indian style with onion, tomato and spices. 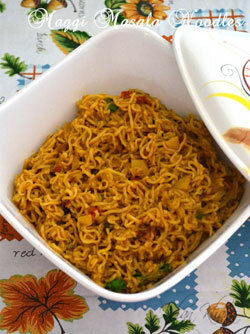 A refreshing and tasty change from plain maggi noodles. Peel and slice onion, peel and dice potato, chop tomato, green chili and coriander leaves. In a pan or wok heat oil add cumin seeds, mustard seeds and allow to crack. Add onion, green chilies and saute until onion becomes soft and golden brown. Now add potato and saute until potato gets cooked and golden brown (chopping potato in small pieces helps to make it cook faster, if adding any other vegetables then finely chop it and add now). Add tomato, stir and add maggic masala from the noodles pack, stir and mix well. Cover and cook until tomato gets mashed well around 3-4 minutes in medium to slow flame. Add 1/2 cup water and red chili powder, coriander seeds powder, turmeric powder, garam masala, a pinch of salt mix well and cook for 2 minutes. Now add 4 cups of water and bring it to boil, add maggi noodles stir gently, cover and cook for a minute. Remove cover and gently pat noodles to break it, mix well, cover and cook until water is fully absorbed and noodles becomes dry. Do stir in intervals, garnish with coriander leaves and off flame. 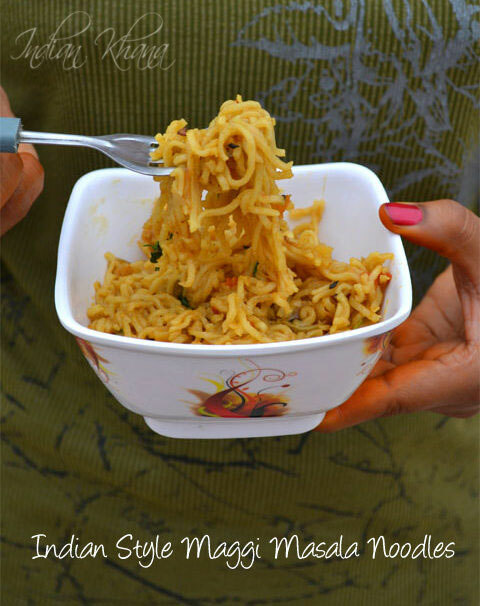 Serve hot/warm, there's no need of sauce with this noodles it's taste just too good by itself. Enjoy the noodles, you will like it for sure if you like maggi.